Staring at your laptop screen all day can put strain on your eyes, particularly if you have a compact model that's easier to travel with. It's convenient when you're packing, but this can cause all sorts of problems from headaches to neck pains, and has become one of the main perils of remote working. Moving around with a desktop computer or large screen is clearly not practical, but a miniature portable projector can provide the perfect solution. It fits in the palm of your hand, making it easy to carry around. It's ideal for when you want to watch video on a larger screen that has HD resolution, or even for when you need to give presentations to clients on the road. You connect your computer to the projector with a USB cable, and the projector shows your computer screen on a larger space, like a wall, curtain, or projector screen. I just picked an Axxa projector and it's been great. 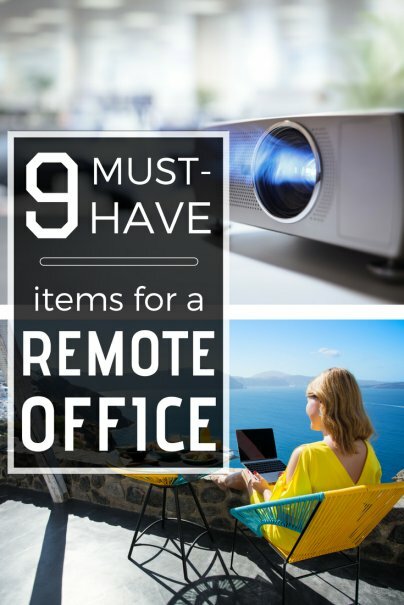 I can just open up Netflix or Hulu on my computer, phone, or tablet, connect it to the projector, and turn any wall into my very own big screen TV. It's bright enough to use inside during daylight, but works much better in lower light. For presentations, it works best if I can dim the lights and close the curtains. A strong internet connection is key to working remotely, but depending on where you are, it's difficult to guarantee. There's nothing a like a spotty or painfully slow connection when you're just at the edge of the Wi-Fi range to ruin a day's work. A Wi-Fi range extender will allow you to increase the reach of an existing network and improve the signal strength. So when you get stuck in a hotel room at the end of a corridor with a dodgy Wi-Fi connection, or find yourself in a cafe with a weak signal, you're still able to make it work. Power surges are an unavoidable reality. Even when you're at home, it's a good idea to always use a surge protector when you're charging your valuable electrical devices, as a sudden jump in power can instantly destroy the components in things like smartphones or laptops — leaving you high and dry. In some countries, these power surges occur more frequently, so it's even more essential you protect against them. Surge protectors are a cheap and effective way of doing this, and will take the damage instead of your gadgets. You can get some with international plug adapters, too, for when you’re traveling in different countries. Many people believe that music improves their productivity when they work, and a Bluetooth speaker will allow you to wirelessly blast out all of your favorite tunes no matter where you are. Also, if you're giving a presentation with video or audio content, you don't want to rely on tinny laptop speakers for the sound. There are lots of affordable options that are compact, lightweight, waterproof, and shockproof, making them great for travel. If you're a remote worker who spends a lot of time in public places, then you know just how annoying it is when there's a high level of noise in the background. It can be distracting and make it extremely difficult to concentrate on even the simplest of tasks. Noise-canceling headphones will make you feel as though you're all alone in a sealed room, even when the world around you is bustling. Models with a microphone will also allow you to make calls in peace, so you can work just about anywhere you please. There are very few gadgets that don't require power to function, and even less that you don't need to charge regularly. Smartphones, tablets, speakers, headphones, and other gadgets can all quickly run down after consistent use, leaving you in the lurch if you're relying on them to work. If you're a remote worker who travels between different countries regularly, then a universal power adapter is an essential item to have in your bag. Rather than carry numerous adapters, just one will do the job, allowing you to plug in your devices anywhere in the world. Some also come with a built in surge protector that has both plug and smart USB outlets. One of the most important considerations for any remote worker is how to best backup their files and documents. The last thing you want is to have a problem with your laptop and lose all of your work. The cloud has made it easy to store documents online quickly and safely, but if the Wi-Fi is slow or nonexistent, it's not a feasible option, and it's certainly not possible to work offline. An external hard drive will give you the ability to back up and store all of your important data regardless of the internet situation. I recommend getting a SSD (solid state drive) external hard drive, as opposed to a traditional HDD (hard disk drive) that works with a mechanical arm-type reading system. HDD systems can be more fragile. I dropped one of my 1TB HDD external hard drives and it never worked again, so I lost 1,000 GB of data! Today, I use the Crucial MX500 SSD as my external drive along with the StarTech adapter cable to plug it into my laptop through the USB port. This drive is meant to be inside of a laptop, but I find that it's more compact and affordable than most drives that are meant to be external. One of the best things about remote working is just how flexible it is. With the right collection of gear, you can set up virtually anywhere in the world and complete your day's work as though you were in a permanent office. But all that portable gear costs money, so it's important to keep it safe when you're moving around. A good backpack is as crucial as any of the gadgets above to help keep your remote office safe. You should get one that provides some padding for your gadgets, has a separate laptop compartment, some integrated anti-theft components, and is also comfortable to carry around.